The XIIth Infantry Battalion (The Pretoria Regiment) was formed on 01 July 1913, from the Headquarters and Pretoria elements of the Northern Rifles. To this was added the Pretoria based companies of the Central South African Volunteers, the Transvaal Scottish and the Transvaal Cycle and Motor Corps. 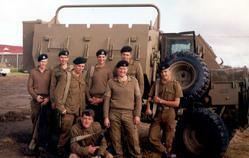 Before the Regiment was a month old C Company was mobilised for two days during the disorders on the Rand Goldmines. In January 19 14, when trouble broke out again, the Pretoria Regiment was given the task of guarding the railway yards and operating staff. When war was declared on Germany on 21 August 1914 the XIIth Infantry Battalion (The Pretoria Regiment) was mobilised and sent into South West Africa. At one stage the Pretoria Regiment covered 230 miles on foot in 16 days, of which the last 80 miles were covered in 4 days with a final burst of 45 miles in the last 36 hours. Welcoming the Pretoria Regiment in 1915 the Prime Minister General Louis Botha, remarked to the Pretoria Regiment Commander: "If your motto is not' Second to None" it should be. Fifty years later the regimental motto "Nulli Secundus" was inscribed on the new regimental badge. On conclusion of the South West Africa Campaign in 1915 most of the men joined the Imperial Service Units especially the 7th South African Infantry for the East African Campaign and the 3rd SAI for the war in Europe. At the battle of Delville Wood in July 1916, Capt LW. Tomlinson of the Pretoria Regiment was awarded the DSO and the French Croix de Guerre. In 1922 Rand Revolt the Pretoria Regiment was reconstitute and within a few days of mobilisation there were 1000 all ranks under arms. Chiefly they freed the railway line from the Strikers' control near Benoni. On May 1928 the Pretoria Regiment provided a Guard of Honour for the first unfurling of South Africa's flag by Princess Alice Countess of Artlone. In 1930 the princess was appointed Colonel-in-Chief and the title "Princess Alice's Own (PAO)" were added after the name Pretoria Regiment. 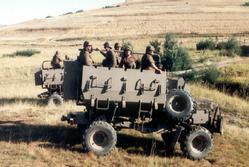 In 1931 the Regiment became fully bilingual and in 1937 a second battalion was formed as an Afrikaans-speaking unit. On 23 July 140 the 1st Battalion, Pretoria Regiment (PAO) was sent to Madagascar in 1942 where they landed at Diego Suarex in co-operation with the Royal Marines. Here, for the first time, they met the Royal Welch Fusilliers to whom they had become affiliated in 1927. Warned that the Pretoria Regiment might have to fight a rearguard action should the Japanese occupy, Madagascar, preparations were made for the Regiment to become a guerrilla force. After the Regiment returned from Madagascar, it was converted to armour, attached to the 6th SA Armoured Division, and sent to Italy. They went into their first action as an armoured unit at the village for Grotte S Stefano north of Rome where the whole Regiment of tanks formed up in line overlooking the village and poured 1200 rounds into it. As a component of the 24th Division, the Regiment and the 5th Grenadier Guards led the advance on Orvieto. At Bagno Regio No 3 Troop of A Squadron was pegged down in the open for 36 hours. They fired close in 120 000 rounds from their Brownings and the Troop leader, Lt Fred Davey, repeatedly crossed the road in the face of sweeping Spandau fire to relay messages when the tank radios were put out of action by German fire. For his brave conduct Lt Davey was awarded the Military Cross, the first decoration, as the Regiment earned their first Italian battle honour. The second battle honour was gained northwest of Serteano. Lt Guy Chennels won an immediate award of the Military Cross for bravery. Discovering enemy preparations for a counter-attack he charged the position five times, inflicting heavy casualties and when his tank ammunition gave out he fired his Tommy gun from the turret and also hurled grenades at the Germans. On 1 August the Pretoria Regiment was outside Florence. After two months of strenuous fighting the Regiment had lost 60 tanks destroyed with 64 put out of action. Next came the Gothic Line. The American 5th Army broke through the Gothic Line. Protecting the left flank, A Squadron was ordered to seize Monte Caterelto. Only the Squadron HQ and one Troop reached Castiglione before the road crumbled, and only two tanks could be brought along the ridge. The Germans counter-attacked twice and were repulsed on both occasions. Then C Squadron advanced on the Bucciagno Spur overlooking Caterelto and on the crumbling glue like boulder strewn track, only one tank remained mobile while the others fired as pill-boxes, alternatively in support of the attack on Caterelto and repulsing counterattacks. B Squadron closed up to join the action and A Squadron tried to break the stalemate by outflanking and forcing that determined garrison back. When winter of 1943-1944 set in, the Regiment first operated as infantry in the snows and then was re-equipped with 76 mm Sherman tanks plus six 105 mm Shermans. In February the Pretoria Regiment said farewell to the 24th Guards Brigade and moved back to reorganise as a combined armour reconnaissance regiment. It emerged with five Squadrons of five troops each. At a strength of 1200 men it was the largest armoured unit in the Commonwealth. Returning to Castiglone in April, the push for the Po Valley began. The Regiment led the 6th SA Division advance west past Bologna. The Po was crossed on 27 April and on the day they reached the Venetian Line on the slopes of Monte Berici Lt Col Johnstone received an immediate award of the Distinguished Service Order for his outstanding leadership in the whole Campaign and especially his skilful handling of the breakthrough of the Venetian Line. 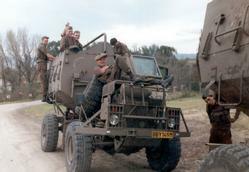 In 1954 the Regiment was once again reduced to one amalgamated battalion and took part in the 1960 Emergency Operation Duiker. Exercises such as Applause 4, Mamba III, and Eland I showed that the Regiment had taken op the task of training itself in earnest. All the hard work also brought rewards. Evaluation results were very high and in 1981 the Pretoria Regiment was awarded the Brigade's floating trophy for the best unit in the Brigade. 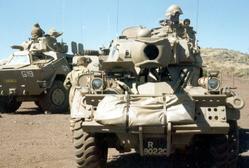 The Pretoria Regiment has seen many changes in history. 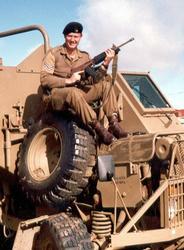 In the 1960's tank crews were converted from Shermans and Mark IV armoured cars to Centurions and Ferrets. 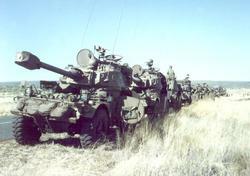 These in turn had to make way for the Eland 60 and later the Eland 90 Armoured car, and the Skokiaan tank followed by the Semel and finally the new Olifant MBT. In spite of all this the spirit of the Pretoria Regiment has not changed. The job to be done comes first. This was clearly illustrated in 1982 when the Regiment supplied troops for the First Regimental tour of duty in the operational area, as infantry. 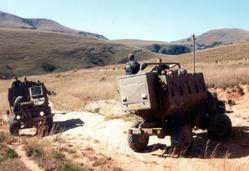 The company took operational duty at Etanga where they spent the rest of the 3 months doing patrol work in the most adverse conditions. A tough comedown for any tank crew but done in PR style. It is interesting to note that these men reported for duty in July 1982, 42 years after the mobilisation of the Pretoria Regiment, also as infantry, for World War II. 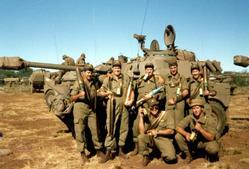 In December 1987 the Pretoria Regiment sent a squadron of tanks into the battle of Cuito Cuanavale. During the battle Major Wim Grobler led the squadron. In a 58 minute engagement eight Angolan tanks were destroyed with the Regiment not losing a single man or tank. All members of the Regiment lived up to its motto - "Second to None". After his promotion Lt Col Wim Grobler commanded the Regiment from March 1991 until June 2000 before handing over command to Lt Col Cliff van der Westhuizen on 01 July 2000. In the new SANDF the PR relies entirely on volunteers, Black and White - and women - to keep up its strength and it continues as a tank regiment in what is now called the Reserve Force. Since middle of 2002 an active recruiting campaign was started amongst the future leaders from in particular the University of Pretoria to address structure according to the economic active population ratio. Hereby then recruiting and training the future commanders and other key personnel and troops from the population of the City of Tshwane. This training also aids in building a capable and responsible workforce from our leaders of tomorrow. During the 90th year birthday and freedom of the city celebrations these future leaders were also exposed to a foundation to start building new traditions and renew ties with the area in which they reside. The 90th year also marked a traditional milestone as far as age goes and for the Pretoria Regiment it marked the beginning of a new era in which it started to apply a total new concept in recruitment and training from a total different base than in the past. As a result of the two recruitment drives during the last ten years the Regiment managed to add back a squadron of tank crews and two fully qualified Lieutenants with another candidate officer confirmed in 2009. This period was also more devoted to maintaining the skills and creating succession and depth in the Regiment to ensure future existence. Due to the nature and dynamics of the Reserve Force members come and go from time to time but in essence the Regiment positively influence the opinions of our future business leaders and opinion formers regarding the Defense Force. The battle honours on the Regimental Colour are SW Africa 1914-15, Madagascar 1942, Italy 1944-45, Bagno Regio, Sarteano, La Foce, Florence, Gothic Line, Caterelto Ridge, Po Valley. Cuito Cuanavale 1989 was recently recognized and awarded. An impala on a mountain representing the Magaliesburg range to north of Pretoria, with in the foreground some succulents. Beneath the impala and the mountain is a ribbon bearing the regiment's motto, Nulli Secundus ("Second to None"). This motto was granted to the regiment by the then Prime Minister Louis Botha after the 1914 - 1915 campaign.